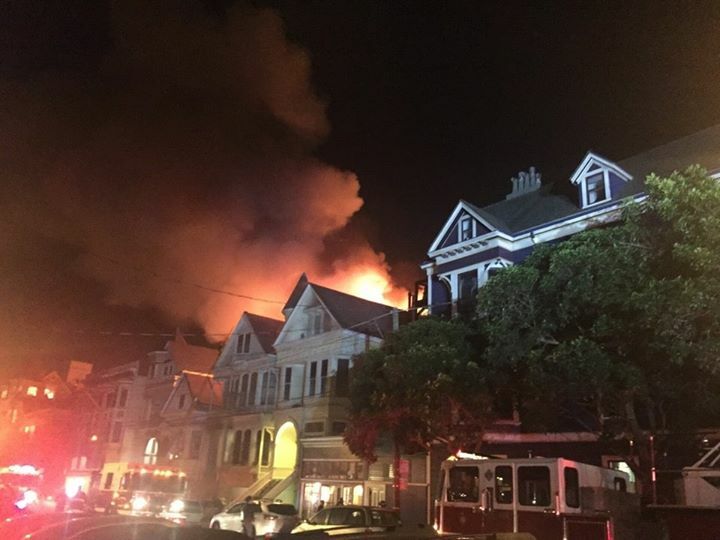 SF Public Works will host a community meeting to update residents and merchants on the status of the project, new safety measures being implemented, and impacts on the neighborhood. SF Public Works is scheduled to resume construction on the Haight Street and Hayes Street infrastructure improvement projects. Construction is scheduled to restart in March 2016 and the contractor estimates about 14 months of work remaining on the project. The project is a multi-agency effort to improve pedestrian safety and upgrade aging infrastructure. The scope of work includes sewer main and water main replacement work, traffic and pedestrian signal work, curb ramp and bulb-out work, bus pad and bus bulb work, concrete street base repairs, and repaving along Haight Street and Hayes Street. Not all blocks listed will include sewer and water main replacement work. 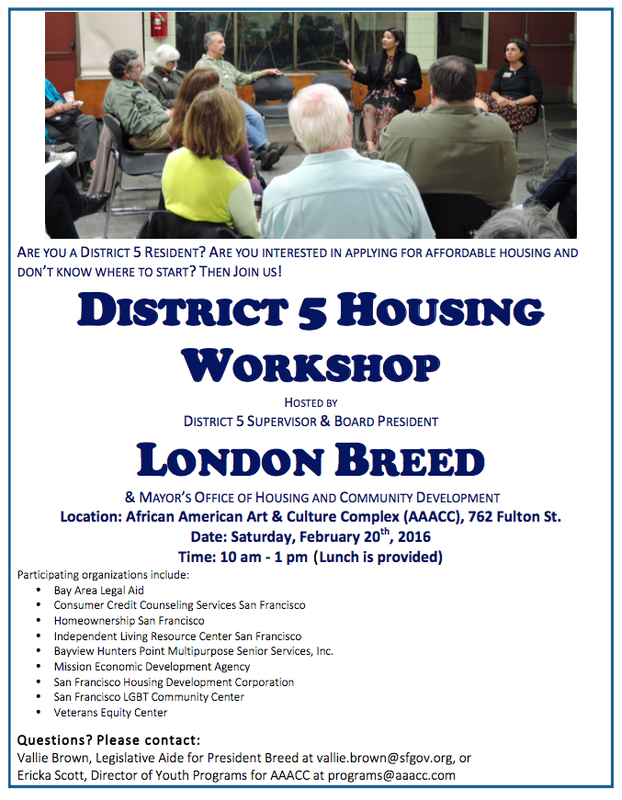 African American Art & Culture Complex, 762 Fulton St.
For D5 residents interested in applying for affordable housing. NOPNA will be handling donations of money clothes and resources for the folks who were burned out via the NOPNA website. If anyone from ASNA would like to be the point person for coordinating donations please step up! Contact board@alamosq.org to let us know if you can help. Fundraiser for Displaced Artists – Wednesday, Feb. 17, 7-11 p.m. 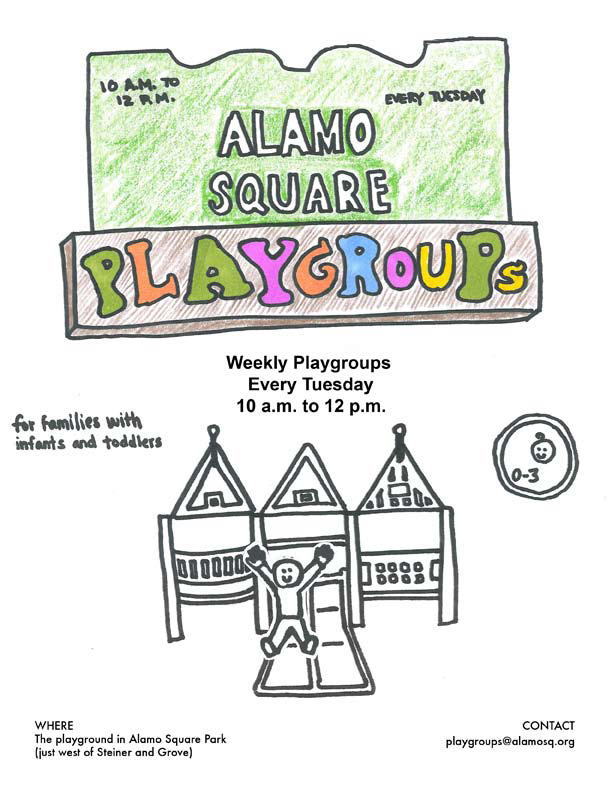 The Alamo Square Playgroup will meet on Monday 2/15 (Presidents Day) instead of Tuesday this week. 10am-2pm at the playground. See you there! Alamo Square Park will undergo a $4.3 million renovation to update the irrigation system, build an ADA-accessible restroom, and landscape the entirety of the park. The outcome of the project will result in water savings through improved irrigation design, the installation of “smart” controllers, and the planting of lawn alternatives, including no-mow grasses that are native to the western U.S. An estimated 3,260,000 gallons of water per year (37%) is expected in water savings after completion. The project is funded by both the 2008 and 2012 Clean & Safe Neighborhood Parks Bonds, as well as a $1.6 million grant from the SF Public Utilities Commission. A contract will be awarded in February with construction anticipated to begin on May 10, 2016 – at which time, the entirety of the park will close. The project is expected to take seven months with an estimated completion in winter 2016-2017. This document was produced to identify tree health and assess the risk of tree failure. 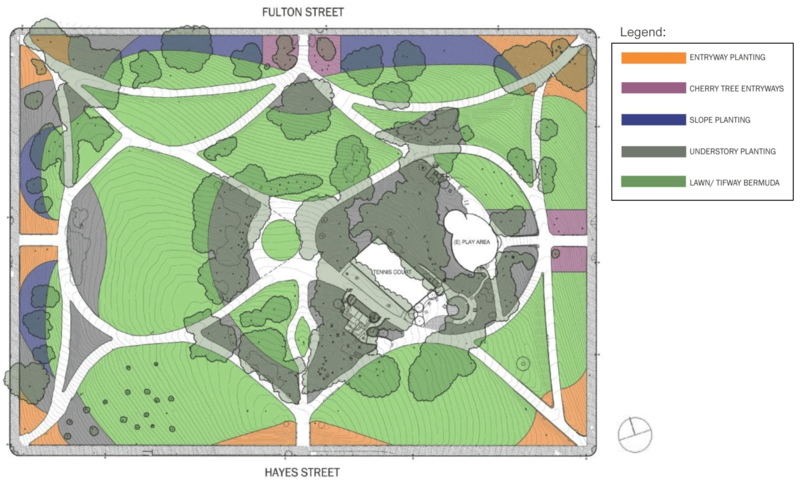 The report evaluates the trees for planning and recommends an action plan which was used to develop a tree replacement program for the trees in Alamo Square.